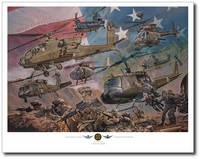 As a military artist, Snuffer receives commissions from military organizations, corporations and individuals. His work is on display at the Pentagon in Washington as well as at U.S. Coast Guard air stations around the country. Largely self-taught, Bryan didn't serious pursue his art career until he was in his mid-30s. He is a member of the Midwest Air Force Artists, which is affiliated with the U.S. Air Force Art Program. 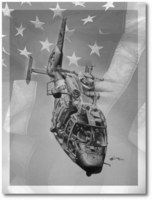 "Death Waits in the Dark"
"Foundations of America's Air Power"
"Return of the Black Ponies"